It has been an age-old myth and old wives’ tale that chocolate is not healthy for you. So much so, that it has often been associated with ‘sin’ and overindulgence. But as it stands, it actually turns out that chocolates hold a lot more benefits for your body and well-being than we’ve ever been aware of. With the passage of time, as more and more research has been done, it has been found that many of the ingredients found in chocolate are actually beneficial for your body. Let’s have a look at a couple of reasons that will give you better insight and less guilt into eating chocolate! It’s important to know exactly what kind of chocolate is healthy for you because certainly not all of them are! Dark chocolate that has a minimum of 70% cocoa is the golden rule here. You’ll be amazed to know that dark chocolate actually hosts an impressive amount of minerals that are nothing but good for your body. 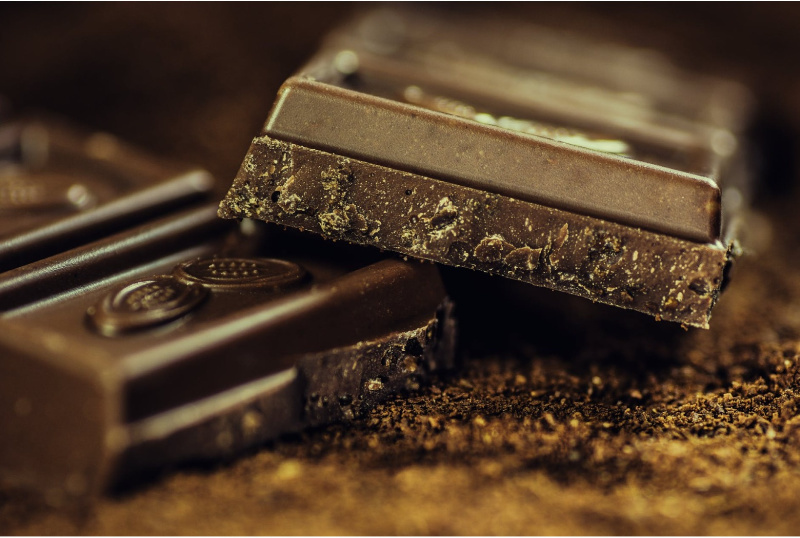 Iron, zinc, potassium, magnesium- these are well-known minerals that are necessities for our bodies to feel energized and healthy, and they’re available in dark chocolate. We’ve always believed that chocolate was guilty of causing acne, but with dark chocolate, this is not true at all. Flavanol is a beautifully, magical natural compound that can be found in cocoa, and what it does for the skin, brain, heart and even the immune system are amazing. It has been discovered that it protects the skin from the sun. So instead of giving you pimples, eating dark chocolate can actually save your skin from pretty bad damage. Cocoa helps reduce stress, and stress causes all kinds of issues and it shows too! So that’s another plus. When people want to lose weight, they stay miles and miles away from chocolate. But this, too, has turned out to be a myth. Dark chocolate can actually aid you in your weight loss challenge. It’s not really that complex. If you have a small piece of good quality dark chocolate, it actually tricks your brain into thinking that you are full, and therefore, you end up not eating as much as you usually would. It’s always nice to invest in something of good quality if you’re going to have it to fix your eating issues. Santa Barbara Chocolate is a favorite in particular because you can find their products easily online, plus they’re organic, which is a definite plus. Debunking the myths of too much sugar in chocolate, dark chocolate has the opposite effect. Research has shown that eating dark chocolate in decent moderate amounts has actually resulted in delaying diabetes. Pregnant mommies are actually encouraged to eat dark chocolate because it reduces stress. Stress is something that is prevalent amongst pregnant women due to their imbalance in hormones. Eating dark chocolate helps in reducing the stress, and in turn, the chances of having a healthy, stress-free mother and baby is increased, all in the name of chocolate! It’s safe to say that chocolate is no longer a sinful secret that you have to keep. Not only is it not harmful, it actually has a surprising amount of health benefits that defy the horrible myths that followed it for years.